So there has always been a lot of talk about how broken the AppStore review system is and developers have pleaded with Apple to fix it. So I thought I would demonstrate just a bit of the problem using a recent review I received for my top application Extreme Agenda. Ok, so there are a couple places we can add drag and drop functionality. But to set time using it and dragging things to other views, how does he see that working? And if he has an idea in mind, how about sending it to the developer? Basically it works where you would definitely expect it to. (Note: we have move/copy and paste implemented everywhere that essentially cover his drag and drop ideas. And we do plan to do more). Ummmm… “Cal Back color” changes the month Calendar’s Background Color and “Back Color” changes the Background Color everywhere else? I can see where with our limited room(because of the iPhone) some labels can get a little confusing, but this is your example? So do you want more or less options, Im confused(see below)?! Well, there kind of is a designer. That is why there are like 6 pre-made themes that ship with the application that you can just use by selecting them and not mess with the display options at all. How about just not tinkering in that screen if you don’t like to as the default theme is a very clean well done theme. “Also, they should remove the “Interface” option and just pick one, that would make testing all the themes easier. As is, not all screens work with all themes/options. Fair enough. We have debated dumping the 3 available “Interface options” (2 for iPad), as there are a few very minor option differences as he suggests. But all themes work with all interfaces, they are just color and drawing settings. I like that the reviewer is exploring the options, but in this case I would think then that you would be someone who wants the most options available. Well you get our program, but I guess the “mess” part is subjective. If you want a simple calendar or reminders app with less options, there are plenty. But like he suggested, they don’t all work that well… Ours does, but if you try to tinker with the options it becomes ‘a mess’? I would argue all day that out of the gate our app is much cleaner and simpler than any of the other few apps that even come close to the functionality found in this app. So what would you expect after reading the first paragraph of the review. Yeah, 4 or 5 stars. Even after reading it all, still probably 3 stars right? Well the problem with the AppStore is each customer gets their own scale… And ‘i.Doug’ decided that a “good calendar and reminders application.” ultimately deserves 2 stars because in his over exploration of it’s flexibility he noticed some small but planned/known inconsistencies. This entry was posted in Opinion on February 3, 2014 by Administrator. So I follow a lot of developers on Twitter, mostly guys anywhere in the range of somewhat to really successful. And I do find it funny that some of them have become like rockstars in our own little community, even though they don’t know much more than any of the rest of us… They just have found an ego somewhere and decided they are now experts and ‘influencers’ because the one or two thing they tried they did pretty good at. And they learned to play parts of this new game pretty quickly. A lot of that was just making the right contacts. And while I respect them and some of their opinions greatly, I just think that thinking you know too much in a market this volatile can be a little toxic. I prefer the guys that are studying the market outwardly, and not the guys that make profound statements that they then are forced to change every six months, but I learn a little bit from all of them…. The AppStore has changed and is hurting small developers with a whole bunch of factors like race to the bottom, discoverability, Apple breaking the top list algorithm’s etc etc etc…Well while a lot of us had started feeling it earlier this year these guys banked on their previous success to continue to say that it is great to jump into the AppStore with new apps. And then they finally got around to trying it!! So now they all have abruptly changed their tune and are like ‘Oh, we can’t maintain a company on just this’. So what can be done. They all have opinions. Even journalist ‘influencers’ with no real background chime in. And having done this for over 10 years, so do I…. Some say freemium can be the ‘magic bullet’. And I’m experimenting with that, and will continue to do more. But it’s a hard game to play, you need a lot of downloads, and there simply aren’t enough slots in the free top 200 lists for all of us to get those downloads… So you have to figure out how to jack up your conversion rates in creative ways without annoying customers or find some other way to make it work… Real added value is key, but it is not enough by itself. Others say Apple needs to offer us trials. I TOTALLY AGREE. I actually did better than what Im doing now in a market fractions of the size of the iOS world back in the Windows Mobile(WM) days with trials for applications. They worked. The world hasn’t changed, people still want to see what the app is before spending money at a higher price point. Shareware made sense then and still does, whether you or Apple understands it. Others come up with it having to do with switching business models. Of course you can do that. But you don’t encourage everyone to do it. It won’t work in all situations. And good luck if you are trying it. Shoehorning what should be a product into a service based system isn’t always a great game plan. How about paid upgrades. Obviously Apple is trying to drive prices down and is against this based on what they have done with their own software. We all know they are trying to sell hardware, but come on Apple, making us guys living off software try to follow your lead doesn’t work. We have no controls to erase reviews when customers backlash over having to re-buy a new App(SKU) or feature our own apps in the store to counteract this. You’ve actually made this worse with including ratings in top list rankings. The ‘Clear’ app is cited as a good example of this and how they broke down to customer complaints that were wrecking them. I don’t necessarily agree in this case. They recently tried the new SKU upgrade path and then backed down. I appreciate Clear’s simplicity and uniqueness and their ability to market that. But it is a simple app. And they don’t add many features and use their own design idea as an excuse not to, effectively keeping it simple. But they then tried the new SKU method and started charging radically more for a ‘new version’ which is essentially the same app, only universal, whether they changed a ton of things to use iOS7 or not. Most people wouldn’t have noticed 90% of the changes they did to use iOS7’s new abilities, and it can be argued they wouldn’t have had to do most of it anyway. Ive seen what they claim to have done. So they wanted to charge customers $5 on an app most paid $1 for to essentially continue getting the regular progression of the app when they added no value to it except to the people wanting it on iPads too… Ultimately they backed into what should have been the solution to begin with…They didn’t devalue their product by backing up. So it is more of an example of why steering us towards this new SKU plan is not a very good idea. If paid upgrade was the model, would Clear have gone that way or just done the right thing to begin with and made the new SKU the Universal version and leave the original title that feels about the same…It should have been more clear to them. It just shows that even a very successful app at these low price points needs to find ways to make enough money, and the solutions aren’t well defined. But what would be great and what I hope is that Apple finally realizes what is needed is to clean up the AppStore. How about charging more to publish apps or keep apps. Think if they charged $100 to be a developer but $300 a year to be able to put apps up. That barrier to entry is bigger and guys that have their apps they wrote in 2010 and haven’t updated in 2-3 years, wouldn’t continue to pay the $300 a year to keep those apps up there. A lot more free apps would also disappear which is great for developers, and the guys that really have good free apps will probably pay it. Maybe after 20 apps or so, they need to pay even more.. Just think how that alone would clean out a lot of the poorly done or older stuff clogging up the store. Nobody cares that you have over 1 millions apps in the store Apple. You don’t play the numbers games elsewhere, how about dropping it here too..
How about forcing apps to be current or don’t have them show up unless directly linked or directly searched if they are not. Think of the ramifications counteracting the race to the bottom this could have if a lot of the bloat and lesser alternatives go away. If there are only 3 free titles competing against your superior niche app instead of 40, that changes the customer mentality a ton. How about adding more categories. Back in WM the store fronts were broken down into sub categories a lot more and it worked well. Apple does it with games and now kids, why not productivity, business, etc… That many more top 200/300 lists… That much better discovery. And reviews are broken, fix them. They always have been. A 1.0 version bug should not be pulling down the rankings of the 4.0 version of the app just because your customers in 2010 saw that as the main way they should contact anyone…. How about we can have those go away if they haven’t applied for years?! And come up with some good ideas for discoverability. Do you really think that ‘apps around you’ is really going to be handy almost ever. Really? But I guess we’ve been talking about this for a long time. And a lot of it is and will continue to stay broken. Actually half the time lately I can’t even get the AppStore on my phone to work right, so… Maybe fix those things first. But come on Apple, if you really care about developers and don’t just pretend to then STEP UP. You are forcing most of us to move on… Ultimately it will be in your best interest for this ecosystem you control to be beneficial to the most developers, not just the largest ones. I hope you figure that out before it’s too late. And good luck to all you developers out there. Until we do get the market cleaned up there is no one right solution.. It got messy and hard. Make a great product, promote it, and get lucky. This entry was posted in iPhone, Opinion on October 3, 2013 by Administrator. So the media has started to adopt a new phrase in the iOS market for a ‘new breed’ of calendar apps. So let us explain what you should probably know about Smart Calendars. Just like any app, if they are giving the product away, it is likely because they will hook you later or YOU are the product. What that means is, they approach features in such a way that they can collect your data while they are doing things on their servers. So not only do you need an internet connection to do a lot of calendaring things, but they are collecting information from you, which ultimately might be sold. For example, Apple has set it up so it is very easy to see your Facebook events in any calendar that uses Apple’s own Event data. Just turn it on in Settings > Facebook. But to go ‘further’ a lot of these ‘smart’ apps require you to sign into Facebook so they can interact with your events directly, Oh and see your other Facebook information. This may be needed if you really really need to edit and live by your Facebook calendar, but do you? And arent you more likely to see it directly from Facebook?! 2. They aren’t necessarily very smart yet. So the new smart calendars are supposed to give you this idea that they have way more functionality than existing calendars. Most don’t. Not even close. And a lot of reviewers don’t really understand the market so will believe the app’s hype. They buy into buzzwords. For example, I just read an article/review that bragged about how this new ‘Smart’ app has sync so can interact with Exchange/iCloud, etc… Well guess what, that is just what you get when you use Apple’s event databases. It is the same sync that all of our apps have. The default calendar app has it. So why is this special?! So a lot of these ‘smart calendars’ have even less of the great features that established apps in the market have had for a long time. 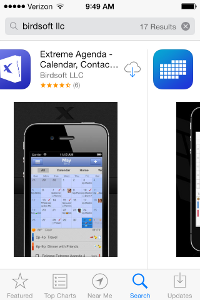 More view types, drag-n-drop and moving and copying, multiple alarms, advanced repeating options, templates, more information displayed, the list goes on and on… Just stop and compare more established apps like our Extreme Agenda and The Grid, and other veteran apps like Pocket Informant and Week Calendar. And the established apps have proven their ability to update and are more likely to keep improving and can catch up quickly, with the better features like weather, natural language entry, smarter locations all already added or coming soon.. These new apps are simply too new and have sacrificed on features in order to look pretty and ultimately get your data. Some of them do offer very neat ideas for integrated features. But those killer new smart features don’t always work very well. There are a lot of predictive tying of data together and displaying of educated guesses. But if the prediction is wrong, which IT IS A LOT, or can’t be filtered well then it actually makes the feature more of a nuisance. Who wants to be shown the wrong location on a map or shown the wrong connected contact. They could be handy when they are ironed out, but rely on connectivity and a lot of data to work seemlessly together. This entry was posted in iPhone, Opinion on July 17, 2013 by Administrator. Ok, I am getting into the “heavy design” stuff, Extreme Agenda 4.0 will be a big step in this direction. And as of yet I have not proven that most of my design heavy apps are over the top great. Well, PokerTimer is the most popular Poker Clock in the AppStore(I did that original minimalist design a few years ago). And ‘The Grid’ did get 120K downloads in 3 days last week…. And the original XA 1.0 was pretty crazy experiment into alternate design. But by no means do I label myself as even ‘good’ yet, I’m learning like everyone else, this whole design focus is relatively new. The most recent post of the branch.com App-Makers is about App Ideas. And granted quite a few in this group have had 1 or maybe 2 really good ones… But so far the direction of the conversation has gone in the direction of high design, one basic idea, simplicity and good UI. Makes sense…and we as developers have all heard it so many times before. That is what is working in the AppStore right now. But let’s examine this. Side Note:coincidentally those are the exact 3 apps I was shooting at with ‘The Grid’ too, that came out at the same time and was overshadowed by Fantastical. So, yeah, he likes Fantastical. But now dissect Fantastical. Really, the App is two views, both beautifully done. But both not always practical in everyday use. Take Fantastical and try to check out what you have going on in October. Yeah, you can’t get directly to October. How about October 2015? And yeah, once you get there they just use the standard ‘colored dots’ to show you an overview of the month. Know what they are? Have 5 events on a day, sorry we only made room for 4 dots. And dont even think about trying to see October in the week/list hybrid view. Their other big feature is natural language event entry. And unless you are a speed typer on your iPhone, having to type in events in real language is neat, but isn’t the most practical (to do certain things you have to have shortcut formats memorized). And a small hint: you can use Siri to do it with Voice for all iCal based Apps. It’s genius on a desktop, which is where the idea came from. Want to edit events the regular way, well another secret you wouldn’t know, they just used an SDK call to Apple’s exact same event view, but put their pretty title bar on it. So I give Ellis the fact that besides ‘Week Calendar’, which blows Fantastical out of the water feature wise, the other calendars mentioned are lacking in areas as well. But they also are priced lower. So what made him overlook this and believe it was ahead was the “Smoother user experience”. Pretty design and a couple neat new takes on features seem to make you not fully examine an app’s long term use? Or Clear is another often used example. Clear did some amazing things with gesture based list interaction. It tried something different and was rewarded for it. But they also went overboard, and did stuff that doesn’t and won’t ever feel natural in order to stick with their paradigm. And Clear offered very few “standard list” features, things that you just expect to be there to make it really handy and usable. You have to dumb down how you use lists in order to stay ‘in love’ with using it, all for the sake of good design and this trend of less features. It’s convenient to use this less is more excuse, isn’t that what Apple does, but yet we are all also clammering for a revamp and more functionality from iOS7 from Apple…WIDGETS WIDGETS WIDGETS. And just think what we could all do if Apple opened up even more development flexibility. That might stifle simplicity. So it makes me wonder. Are we just at a time where we’re tearing it down to build it back up, making cheap apps what cheap apps should be. As one developer said, these *great* app ideas “reset the baseline”, but it seems some are doing so with inferior apps. Will these apps grow up or be passed in the mainstream by a higher level of app. UPDATE: Well, it appears Branch pivoted, which made their site way simpler and less usable, but also does away with the group/clique thing that had irked me. It is just as well, the ‘moderator’ that had created the clique had dropped the ball and not kept it active, something that having more members would probably have helped. I recently noticed a post he made about how his original app, that one a design award, was outsold by his new app. He is one of the design and simplicity guys I talk about. I don’t get how he never realized that his first application was only half an idea, and had he actually created a full application with his award winning design abilities in the first place it would have sold a lot better, instead another product took all of those sales and more and does extremely well. Luckily he did better on his second product, but not realizing this makes me wonder about having him be a speaker and an ‘influencer’ in our market. And using the simple thing as an excuse failed …. This entry was posted in Opinion on February 4, 2013 by Administrator.